But first, here’s a catch-up on construction and materials used. Rather than explain in minute detail each step, I will for now just point to the resources that provided the most direct and useful information. They are the nuggets gleaned from numerous trawls through crappy/broken code and bad schematics. The LED matrices are just too big for the breadboard, so I propped-them up on stackable headers to allow me access to the pins. I’m using 2 x MAX7219 driver chips. 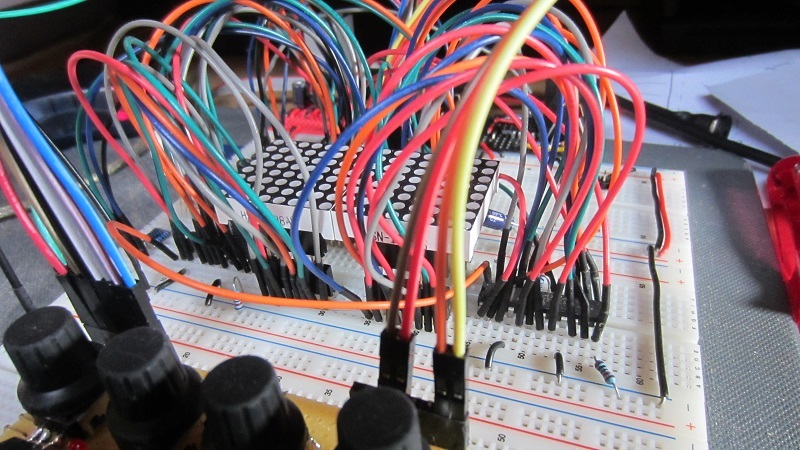 Connecting these to the ATMega and to each other was a breeze, however wiring the matrices themselves was a little tricky. I mostly followed the instructions here, however this wiring was not correct for my particular LED matrix (common cathode – from Tayda). I found the wiring diagram here to work for me. The encoders were connected and via the MCP23017 I/O port expander. I got these encoders from Reichelt – they are quite stiff and they have been problematic. Firstly they wouldn’t stay on the breadboard (legs too short!) so I made a breakout. Those funny protrustions are my attempt at hardware ‘debouncing’. I soldered sockets to the pins so that I could experiment with different capacitor values. 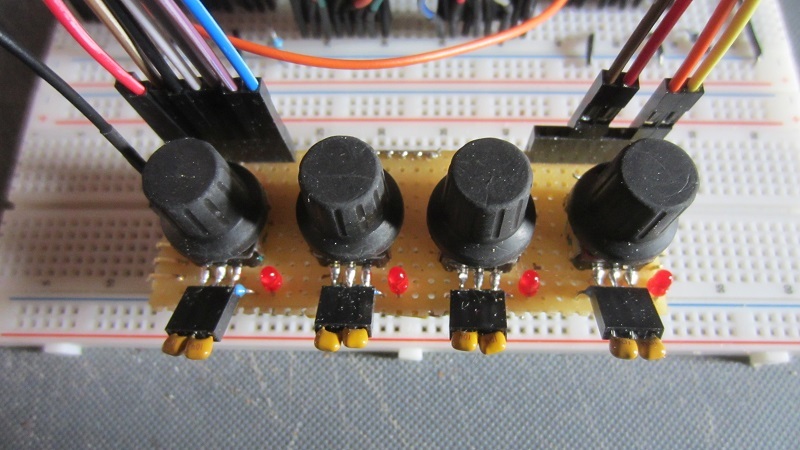 In the end, 100n capacitors connected between each pin and common ground were best, although the encoders were still somewhat jumpy. I used a healthy dose of contact cleaner on each and this helped significantly. These encoders need to be ‘broken-in’. In the code I am polling these controls according to this helpful post. This works well but is quite the resource drain. To circumvent this I tried using interrupts, however they proved even more problematic because they were detecting even the slightest tap of the encoders. Also, setting-up interrupts via the MCP23017 is no trivial task. I managed to fry two chips for my troubles. Interrupts are for another day…. In the next version I will abandon the mechanical encoders in favour of optical. I think the additional cost will be more than compensated by time spent, in frustration, fixing a problem that is beyond my control. 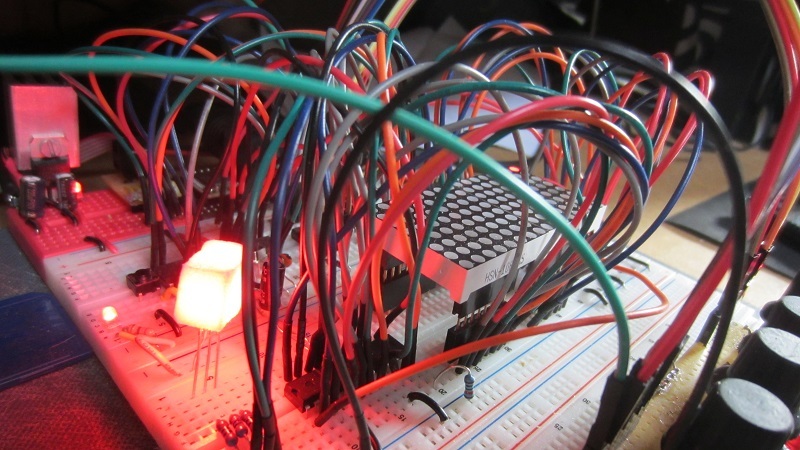 Finally there is a RGB LED which provides instant access to 7 colours as menu indicators. I’ve coded a state machine that allows me to turn 4 encoders into 40 controls, depending on what sequence of buttons is pressed. The mode is indicated by the single-or-mixed colours of the RGB. Thus there is always a clear visual indication of which menu is currently in use. When I finish the code I will publish it, along with a proper schematic (hey, I’m still learning). This entry was posted on	November 1, 2014 at 12:59	and is filed under DIY.